I was asleep by 8:04PM on Saturday night. That is early for most seven year olds, and definitely for a thirty-nine year old. It was glorious. I usually whine and complain about switching to Regular Time, because I love the extra hours of sunshine that Daylight Saving Time brings, (yes, there is no “s”), but not this year. Not only was I incredibly appreciative of the extra hour I magically gained the night before the NYC marathon, I have since been just fine with the early nights. I used to begrudge this time of year because the newfound cool air and vanishing sunlight brushed too close to my still clinging to Summer bare skin. I live in the warm/burning hot section of Southern California, (north of LA), and I am hot nearly all year long, so that the sudden drop in temperature and daylight demands an abrupt and unsettling shift to my routine. Also, I usually have my head down in training for most of the year until wah-la, the races are over and it is time to chill, a part of the process I loathe instead of embrace. The fact is that this time of year has always been a real struggle because I feel separated from a huge part of my identity, the athlete. My races are over, it is the “off” season, the time of year to recover and re-attach to the world I have been orbiting, but not fully engaging in since the beginning of January when I went to triathlon camp, until a week ago after I crossed the final finish line of my season. The highlight of last week, swimming in the ocean with SMOG alongside my friend and teammate, Bridget Haga. Photo courtesy of Bridget. I have always wrestled with this necessary phase of re-engagement with the world. The reality of training for less than two hours every day is tough, especially when running is not an option for two weeks, but finally, finally, I am enjoying filling that gaping hole in my day with the “training” my body and mind really need this time of year. For example, I have spent my time sleeping, eating, sitting, laying down, writing, catching up with friends and family, (over the phone and in person), brainstorming goals, scheduling the next race season, prepping/shooting/editing and watching movies, cleaning my house, (especially organizing my creative space in my office), visiting the library, (a ten minute walk from my house), writing letters to heroes and old friends, cooking, reflecting on the fantastic year I lived, hugging my dogs, hugging my husband, (he is finally home from months away filming Lost In Space in Canada), hugging Hannah from afar, (she is a hip college student now, so I rarely see her in person), and hugging and high-fiving myself. Miraculously, the shift in seasons this year has inspired my routine rather than disrupt it. A photo of my cute hub, Marion, captured in person this morning. He will have to return to Vancouver for a few short stints of shooting, but the long haul is behind us. The greatest lesson I learned from studying Experimental filmmaking in college, was to appreciate transcendence in the everyday, the magnificent mundane seconds in life that make up those magical moments. 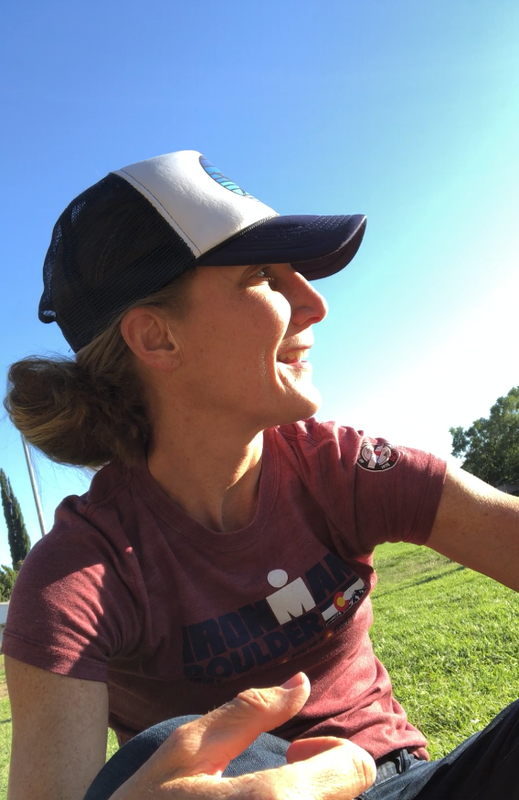 Honestly, I enjoyed the countless ego-stripping, lonely moments within hundreds of workouts this year more than any finish line I crossed, because it was within those depleting seconds, minutes, and hours, that I became stronger even when I felt weak and found joy while hanging onto the edge of exhaustion. There is still so much I want to experience and accomplish as an athlete, writer, coach, producer, wife, daughter, sister, parent, and human-being, but in years past, (every single year), I felt anxious throughout these dangling final weeks on the calendar, and now I feel grateful and excited. Even if the daylight slides away quicker than I want it to, or if the temperature drops below a comfy 70F, or if I ride my bike instead of run, today will be beautiful because I woke for up it.